Historically, over 80% of the state of Iowa was tallgrass prairie, yet today less than 0.1% of that endangered ecosystem still exists. To combat this loss, tallgrass prairies such as Anderson Prairie have been planted to return some of the environmental benefits and biodiversity of the historic grassland ecosystem to the landscape. Anderson Prairie is a 24.7 acre tallgrass prairie planting (Figure 1) located on the northeastern edge of the Luther College campus in Decorah, Winneshiek Co., Iowa (43.315° N, 91.799° W). The prairie borders a mixed hardwood forest (Hickory Ridge Woods) to the northeast, consisting predominantly of bur oak, shagbark hickory, and red cedar trees. Located to the southeast (Ridge Road) and to the northwest of the prairie are residential areas, while to the southwest is College Drive and the main campus. The mean annual temperature (1893-1993) is 7.4°C (45.3°F), and mean annual precipitation is 808.7 mm (31.8”). Soils within Anderson Prairie range from sand to a sandy loam. Prior to 1988, the site was used for row crop agriculture by the college farm. In May 1988 the “sloped” northeastern half of the prairie was planted with a mix of 4 native grass species and a light mix of 9 native forbs when the field was entered into the CRP program to reduce severe erosion problems. Anderson Prairie was dedicated by the Board of Regents on November 11, 1995 to honor of Jutta F. and H. George Anderson, the wife and President of the College who enjoyed walking through the prairie in the early 90s. In 1994, burn breaks subdividing the prairie into management plots were established, and these regularly mowed trails are used heavily for recreational and management use. Anderson Prairie is currently divided into 19 separate research plots where various management treatments are implemented. Treatments within the prairie include plots mowed every other year to mimic grazing, and plots burned with spring burns on 1, 2, 3 or 5 year intervals, or a 3 year interval on mid-summer burns, to mimic possible historic fire frequencies present in the pre-settlement landscape of northeastern Iowa. Management of Anderson Prairie since 1994 has been performed primarily by the Department of Biology in collaboration with Luther’s Natural Areas Land Stewardship Crew. Baker Village was intentionally sited by the Board of Regents away from College Drive near Hickory Ridge Woods to maintain the open viewscape along College Drive. With the construction of Baker Village on some of this area in 1998, the prairie was expanded into the ‘lower half’ of the prairie (southwestern half). Eleven acres were planted by the college in November 1998 with an investment of over $20,000 in a high quality seed mix of 5 native grass species and a heavy seeding rate of 71 species of native forbs. The primary method of managing Anderson Prairie is the use of spring prescribed burns, some mowing to mimic grazing, and occasional mid-summer or fall burns when research needs warrant the availability of those treatments. One ongoing management issue is the constant battle against encroaching Japanese Amur maple seedlings that sprout annually from the heavy seed load from the line of maple trees on the SW side of College Drive. Along Ridge Road are quite a few elms and box elders that also contribute woody seedlings. Periodically, cutting and spot herbicide application on stumps is needed in addition to fire to control these invading woody plants. Late-May burns after green-up have been used in several plots with heavy brome grass infestations. Mid-June mowing of plots with Canada thistle infestations at bud stage have effectively reduced Canada thistle in Anderson Prairie. Anderson Prairie is used primarily for teaching and research by a number of academic programs on campus, as well as a training site by athletic teams, and is a popular and close recreational site to the central campus used by students, faculty, staff, and the Decorah Community for walking, hiking, mountain biking, and cross country skiing. Anderson Prairie provides a number of important environmental services, of which the most important is the absorption of surface runoff during heavy rain events from Baker Village and the Vennehjem development, both which funnel significant amounts of runoff into the prairie. Tallgrass prairies also can sequester over 1 ½ metric tons of carbon per acre per year, providing an important sink for atmospheric carbon. Anderson Prairie is home for 71 species of native prairie plants and numerous species of animals. For example, researchers have found 5 species of beetles living in Anderson Prairie that are "state records", found no where else in the state of Iowa. Anderson Prairie is also estimated to contain over 40,000 common milkweed plants, resulting in the production of over 1,000 monarch butterflies per year. Of particular importance is the role Anderson Prairie plays in providing an educational example of the native Iowa prairie landscape at a highly visible location within the city limits of Decorah within view of the central campus and College Drive. Currently, over 3 acres of Anderson Prairie has been set aside for the planned completion of Baker Village as part of the arrangement with President Baker expanding the prairie into the area along College Drive in exchange for building Baker Village on previously established areas of the prairie. Students conduct plant community sampling in Anderson Prairie. "Pollination by Bumble Bee" taken in Anderson Prairie by Meghan Owens, 3rd place winner in Luther Natural Area photo contest. 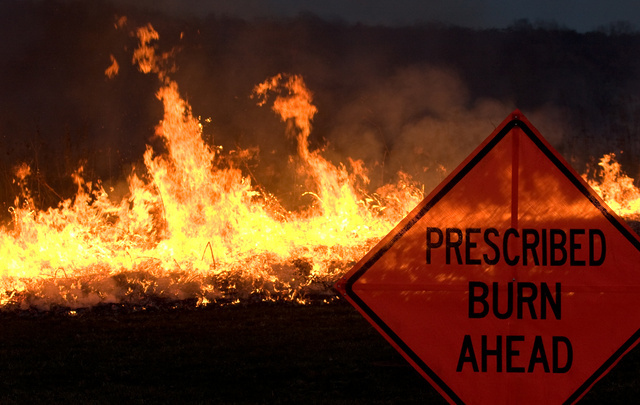 Night prescribed burn in Anderson Prairie.